Name, age, hometown: Michael Larkin, 18, Swansboro, N.C. What corps are you in and what is your role this summer? I am in Carolina Crown and I am the co-section leader for the contra section. Give us your full drum corps/marching music background. I marched every year in high school and was drum major my last year. 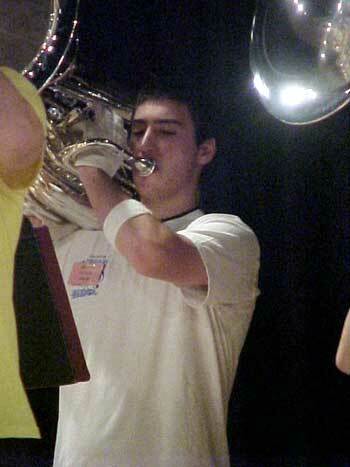 I marched with Carolina Crown in 2003, 2004 and the upcoming season. How did you decide to be a member of your corps? In my sophomore year in high school, we had this marching and music tech that had marched at Crown, and one day I decided to talk to him about it and he told me that I would have so much fun. What first attracted you to the drum corps activity? When I first started listening to the music and watching videos of shows, I was so impressed and thought that I HAD to do this. What advice would you give to young people who want to march? Don't be afraid to audition somewhere. You will never regret that you had marched, and you will always remember after you age out. The last good book I read: "Inner Game of Music" The last great film I saw: "National Treasure" Where I go to school and what I'm studying: I go to the University of North Carolina at Greensboro where I study music education. Jobs I have/have had: I have worked on Camp Lejeune marine corps base as a sales associate in a military clothing sales store. Three CDs I'd want on a deserted island: The 2004 top 12 drum corps. My favorite TV show: "Family Guy" Favorite performers: Chicago Symphony Orchestra How do you "blow off steam?" Play really loud, and if that doesn't work, then play louder! What has been your formative drum corps moment? In 2003 when we came off the field for the last time at the Citrus Bowl. That was probably the most emotional feeling in my life. As soon as we were all gathered under the stadium after we came off the field, all the staff did was clap. That was the greatest feeling and it's one that I will never forget. Best drum corps show ever: Cavies 1995, "The Planets" What are you most looking forward to about the summer? The rush that you get after you know you just threw down on the field. Best thing about being in a drum corps: The many people that you meet and friends and connections that you make. But most of all, the experience. Worst thing about being in a drum corps: Having to sleep on the bus. During tour, the best part of the day is: The warmup before the show. Everybody is just so focused and relaxed, but intense. During tour, the worst part of the day is: Definitely waking up in the morning and dragging yourself out of the sleeping bag. Favorite drum corps personality and why: Matt Harloff. Matt is a great person. He knows how to get things done but still have fun at the same time. Matt has inspired me so much since I have been at Crown. He has taught me to always set goals for myself and to do "whatever it takes" to reach them. What I want to be when I "grow up": The conductor for the Boston Pops Symphony Orchestra, or probably just a band director. Haha. Describe what you think a typical DCI show will look in 2015. There will be lasers, synthesizers, strobe lights and maybe even bass trombones! Feel free to add anything else you'd like. If you see Crown this year make sure you come say hi. I'm the tallest one in the corps (6'8") and I march the biggest horn, you can't miss me.